Watching last night’s dismantling of KSU, esp. the Jayhawk’s switch to zone to protect those in foul trouble and save the legs of marathon man, Devonte, I kept trying to make sense of what zone they were playing. It sort of looked like a 2-3 zone, but then it looked like a 3-2, but in the end, it sort of looked like an amoeba zone! Devonte swung around the perimeter like a tether ball, following the rock to the point of a double-team zone. Is that even possible? He, and others, but mostly D-Tae, appeared to be tracking the ball and collapsing on it on the perimeter to the point of a ‘double-team zone.’ Is this a ‘match-up’ zone? Whatever they were doing, KSU never put anyone in the middle of it to pass out of it from the top of the key, which might have been a failure to execute on their part, poor coaching and preparation, or the fact that KSU couldn’t figure out what that zone was either! Never having played basketball myself in anything other than the occasional HORSE contest where I am, in fact, a driveway legend…can someone explain to me what a ‘match-up’ zone is? Thanks in advance! Looking forward to what the “Buckets Brain Trust” comes back with. @MNJayhawk Dtae was wearing those legs out! He was working that top of zone! @Crimsonorblue22 Agreed! As a way to rest him, that particular zone didn’t seem the most effective! Every time he hits the floor, I hold my breath, hoping he gets up okay, and that the cumulative nature of the hits, falls, and game minutes doesn’t take him off the floor or out of his game. What was interesting was that the talking heads before the game were saying Wade was a nightmare matchup for our guards, including Svi at 6’8" because he would be able to shoot 3s over anyone guarding him. The zone dbl teams stopped him cold, but I noticed he hardly ever tried to shoot over DG and kept his back to the basket every time he received the ball on the perimeter. He should have tried facing the basket a couple steps further out so he could step up, square up and shoot over our small guys. @mayjay The KSU game plan…for lack of a better term…looked so much different from the one employed at AFH. Brown and Diarra seemed to be back on their heels, Wade looked like he was waiting for someone to start the offense so he could get into it…and no one seemed to be the ‘motion’ guy that Weber uses often. They were standing around a lot, and when they did move, it didn’t seem to have purpose. When Self went zone, everything that was stalling for KSU’s offense in man-to-man seemed to get worse. All I know is Bruce doesn’t know what a zone is. KSU did not anticipate KU playing zone (that one is on squeaky), did not plan for it and did not know what to do; they had plan to execute the poke-a-Doke but never had a chance…and this is why, boys and girls, Coach Self is at the top and Weber is not. It looked like a 2-3 zone for the most part to me, it can look confusing at times because the two outside guys on the bottom have a ton of ground to cover, so when guy caught the ball on the far wing or corner, DTG or Malik came over to trap or let the gunners as we called them get back to protect the hoop. Doke appeared to just stay in the middle for the most part along with Mitch. @MNJayhawk Drive way Legend, I like that lol. A “match up” zone is where all the uniforms of a given team match up. None of this one guy wearing pink Converse and the next guy wearing lavender Nikes. All the jerseys, shorts, shoes and socks have to match. Then they’re in the zone. You’re welcome. KU was playing what looked to me like a 2-3 matchup zone, similar to what Boeheim teaches at Syracuse. The idea is that the top two guys handle everything up high, but when the ball reverses quickly, the guy on the bottom of the zone on that side steps out to guard the wing while the zone rotates. This allows the top two guys to pressure the middle and the wing without having to scramble and lose the high post when the ball swings. It also allows for optional traps if the guy on the wing picks up his dribble in a bad spot. It was clear that Self still wanted ball pressure out of his zone, which required Malik and Devonte to work on each rotation. Because Svi and Vick both play lots of perimeter D, it didn’t cause mismatches when they rotated up to guard the ball on the quick swing. @justanotherfan It reminded me of a college hoops video game I used to play on x-box (the original). In that game you could play zone and basically force the ball wherever you wanted by applying pressure then either let the hapless scorer shoot from deep or trap to cause a turnover. KSU looked every bit as bad at times as the primitive AI. In the dynasty mode you could just recruit 6-5 to 6-10 SFs and play em anywhere. @justanotherfan THANK YOU! You rocked that answer. Much obliged! 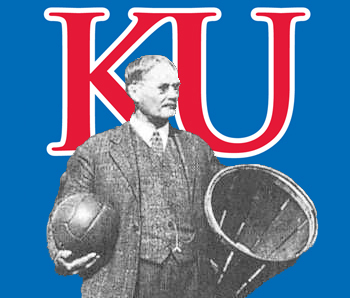 @kjayhawks A legend in my own mind, anyway. Is there a reverse box and one? Where Dok just roams the paint and the four guards play man 2 man? @dylans they call it the dot and 4. Much more prevalent than the line and 3. It was the morphing zone Self has been using this season. Some time they stay in it, other times middle base line man floats up to make it a 2-1-2. To fool the opponent, sometimes the 2-1-2 has a perimeter guy at the 1. He then guards ball for a box and 1. Sometimes the 2-3 and 2-1-2 morph into the old 3-2 junk zone with 3 guys guarding the stripe. I thought I saw all of it for brief moments. @MNJayhawk It changed practically every possession. 2/3, 3/2, 2/2/1, etc. One time DG forgot we were playing zone, and started playing man, and then backed off when he realized it. Certainly you could call it an amoeba defense. @KUSTEVE Bruse weber called it the bane of his existence! Usually, if a team is doing that, it is because the opposing big man isn’t a threat to score, in which case the center can just guard the paint. OU actually did that a couple of years ago when they played KU and Lucas was in the game at the end. Oregon did that with Bell quite a bit against KU last year in the Elite Eight. Bell is pretty mobile, so he didn’t stay exclusively in the paint, but he hung back quite a bit and basically covered up any drive rather than having perimeter guys help off shooters. @justanotherfan Like KSU’s big man (can’t remember his name)? I’m just curious to see if it’s an effective D situationally. It can be, so long as the big man isn’t a scoring threat. If the opposite big is a scoring threat, you will be constantly out of position on defense and you might as well just start a layup line. It’s actually more effective at the HS level, where a dominant big man can control the paint and not have to worry so much about a guy scoring against them. I think Olathe NW played that some when Willie Cauley Stein was there because he could guard the rim without having to roam too far from the basket against most HS big men. In college, centers are more likely to be adept at the pick and roll, as well as catching lobs, making a defense like that less effective because a guard can drive and just lob it up for their big, even if that big man isn’t a good offensive player. Like any zone, it is match up dependent. If, for instance, you sub out a guy that isn’t much of a scoring threat for a stretch player (someone like Mitch, for instance), you can’t play that type of defense because you are gifting Mitch a bunch of wide open 17 footers. I guess I’d toss in that I felt that it was a pretty standard 2-3. I would agree with @kjayhawks. KSU’s spacing dictated how our players moved, and that can create a different alignment. Example, when the ball moves from the top of the key straight left, the top right defender will be head up and the defense will resemble a 1-3-1 as ball side baseline defender and the top left defender flank the back line middle defender. Further, when it comes to a matchup zone, remember that man principles dictate when you are guarding the ball. Some folks will say they are playing a match up zone, but they aren’t. Match up doesn’t mean that you simply go to the player in your area when they get the ball – that’s not the match up being referred to. A true match up zone is when you guard the player in the area as if you are playing man defense – the same kind of in your face defense you see in man. The wing on the zone may deny the touch to the man he matches up with. The on ball defender will target and close out on his “man” in the area. When the ball flows from areas of the zone, it almost looks like a switching man to man defense. Zone principles blur a bit. I know some folks will say you still play zone away from the ball, but in a match-up zone, you will play a true “ball-you-man”, and you will play more angled with both the ball and your “man” in clear sight. In a true zone, you will see the chest of the defender more often facing the ball. It’s why the lob over the top is so lethal against a zone. @justanotherfan Yes I agree. What I really don’t know is Dok’s ability to play “center field” I’m not sure how he’d respond to the space. It would require a ton of discipline to not get pulled up to the free throw line. That is an excellent point. If your back line guy loses discipline, you’re giving up layups and dunks all day. It’s a difficult assignment. Calipari did it with Anthony Davis sometimes when he was at UK, but Davis was an amazing collegiate defender. There aren’t many guys out there who can anchor the back of a defense like that. The last guy KU really had that could do that for any length of time was probably Jeff Withey, simply because he understood angles on shot blocking so well. Most teams don’t have a guy like that. The only guy I could see that could do that in college hoops this year would probably be Mo Bamba at Texas. There may be others, but he’s the one that jumps to mind initially. Also, I love the zone defense. We were screaming for that a few years back – in the “3 pointer is evil” days. @JayHawkFanToo I prefer to call it " the freak". @MNJayhawk Can we curse on here? I’ll edit my response accordingly. All fun, no malice. “A Driveway Legend” Rolling on the F***ing floor! I was having a hard time figuring out KU’s zone defense too. Bonkers! Bet Self uses this hybrid zone going forward to protect DG. (Devonte) I call him that, DG. @Lulufulu I think we’ll see the zone more, too, since evidently, opposing coaches don’t practice it all week. Oh, wait, that was just Weber. You can call Devonte whatever you want as long as he stays healthy! Would love to see the zone more if it proves effective again. A key was being able to rebound out of the zone which has been a season long struggle for KU. In the right matchup this zone could prove to be a key adjustment made in-game at some point (maybe even a tournament game). Have to be careful to not overuse it otherwise oponents practice for it and becomes less effective. It worked well at KSU because it was unexpected and it was not ready for it; teams are now aware and likely be somewhat more ready for it, some more so than others. I think we can expect to see the zone quite a bit moving forward, especially if it is effective. In the old days, a zone used to save your players’ legs. Forget that today. With the trey threat more floor has to be covered and those responsible for defending the trey line end up usually expending more energy than a M2M. Kind of depends on how hard your players are willing to play. But I think our main reason for going zone is to protect Doke from foul trouble. Not sure if it does that well or not. Doke’s fouls are often off the ball and make little sense. I’ve been away for a week so only caught a few minutes of the purple kitty pounding. Hope to watch the game in entirety tonight. Can’t recall if it looked more like a 3-2 or a 2-3. Our positioning really depending on where KSU setup. I really hope Bill continues to explore zone defense potential. He’s a clever coach and within the framework of a zone, he can create some interesting possibilities. With our limited bench this year, we need another big weapon to use in games. I’m not sure it is a bad thing to have our opponents have to practice against a zone to prepare for us. Yes, it may mean we don’t quite see such a big shift in play when going to the zone… but on the other hand, we may be weakening our opponents’ play against our M2M because they have to spend time practicing against the zone. We also have to look at our side of the fence. How much time do we spend practicing our zone? All that practice takes something away from our focus on M2M. It’s all a bit of a risk and I don’t think we would be doing it if we had more depth. Self seems to look at all defenses that are not straight up M2M as “gimmick” (including zone defense). This goes back to his roots at Ok State. Self is looking for ways to gain advantages. If he can give our guys another legit tool without having to change our identity or shift very far away from our M2M (our identity) then adding zone is mostly helpful. I don’t think we are spending a crazy amount of time working on zone in practice. For one reason, we have been limiting our on-court practice time. We do need a zone in our tool chest because of our limited depth. But I think Self analyzes carefully how much time he has our guys focus on zone over M2M. He knows there is a risk to taking away focus from our M2M to give towards zone. I agree there is a bit of risk with switching defenses. The hope though is gaining an advantage, something we gained against K-St. Playing zone protected guys in foul trouble, psychologically forced K-St into perimeter shots (which they missed plenty) and KU was able to rebound well enough to stay in the zone.